Today was my first effort to find sea glass, and I think it was a great day: 4 blue, lots of green (different shades), some brown, some white, and some what I consider the old coke bottle (greenish white). About a third of them are very frosty with rounded edges, and size variety is nice too! I was only out for about 2 hours, so I consider this excellent, but maybe only good for the scale below! 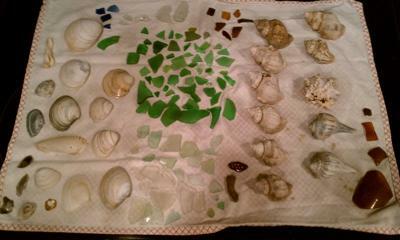 --- Good - 5 to 9 pieces of jewelry grade sea glass found per hour. If you ever have the chance to go to St. Maarten, Simpson Bay beach has sea glass by the bucket full. Lots of blue and brown to boot. Also found red on occasion.